Reliability and power! Yes, they go together. A complete performance replacement of the stock Holset turbo that reduces EGT’s and high turbo drive pressures. Save your head gasket and enjoy longer engine life, with these quick spooling turbos designed for up 700HP. Street and track performance from the most complete bolt-on kit on the market! 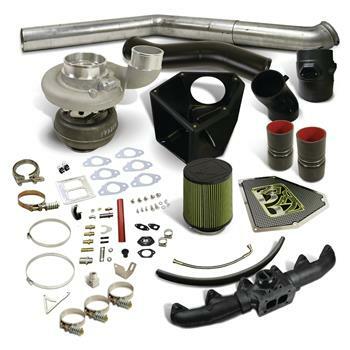 Out performs modified Holset turbos and other “add a turbo” kits. Kit includes custom formed silicone coolant hose, and all supported hardware guaranteed to give you the O.E. look and finish and seamless install!